Today, Initiatives in Art & Culture (IAC) announced the agenda for its roster of presenters at its 17th Annual Fashion + Design Conference, entitled “Trailblazers,” taking place November 13 & 14, 2015. A Thursday, November 12, evening reception that launches this event will be held from 6 to 8 p.m. at Staley-Wise Gallery (560 Broadway, FL 3) in celebration of the exhibit “Ron Galella: 55 Years a Paparazzi.” The event also will feature a reception and viewing, beginning at 6:30 p.m. on Friday, November 13, at Featherstone Fine Jewelry Atelier (17 Vestry St.). Formal sessions for this event will be held at The Graduate Center, City University of New York (365 Fifth Avenue). Presenters include: Adriano Goldschmied, Denim Entrepreneur; Alexandra Steigrad, Media Editor, WWD; Alyson Walsh, Author, Style Forever: The Grown-Up Guide to Looking Fabulous; Andrew Bolton, Curator, The Costume Institute, The Metropolitan Museum of Art; Ariel Foxman, Editorial Director, InStyle and StyleWatch; Ariele Elia, Assistant Curator of Costume and Textiles, The Museum at FIT; Bob Bland, CEO/Founder, Manufacture New York; Bradley Rothenberg, Co-Founder, nTopology, Inc.; Caitlin Weiskopf, Executive Director, ShopBAZAAR; Chi Huynh, Founder, Galatea; Dennita Sewell, Curator of Fashion Design, Phoenix Art Museum; Despina Papadopoulos, Wearable Technology Director, WWA & Founder, Studio 5050; Elizabeth Way, Curatorial Assistant, The Museum at FIT; Emma McClendon, Assistant Curator of Costume, The Museum at FIT; Franҫois Girbaud, Denim Designer; Freddie Leiba, Fashion Authority and Style Curator; Gabi Asfour, Creative Director/Founder, threeASFOUR; Gary A. Wassner, CEO and Principal, Hilldun Corp.; Hebe Schecter, President, Fabric Division, Kaltex America; Hisano Shepherd, Designer, little h; Igal Kaptsan, VP Product Management, 3DVIA; Jean Hegedus, Global Business Director–Denim and Wovens, Invista; Jeffrey P. Silberman, Professor and Chairperson, Textile Development and Marketing Department, FIT; consultant to the International Cotton Advisory Committee Secretariat, and Executive Director to the International Forum for Cotton Promotion; Jeremy Shepherd, CEO, PearlParadise.com; Jose Hess, Jewelry Designer; Kate Davidson Hudson, Co-founder, Editorialist; Kathy Grenier, Public Relations/Marketing Director, The Cultured Pearl Association of America; Lauren Indvik, Editor-in-Chief, Fashionista.com; Lindsey Unterberger, Executive Digital Editor, Glamour; Maria Cornejo, Designer; Mark Messura, SVP Global Supply Chain Marketing, Cotton Inc.; Matt Isaacson, Director of Product Development, Lashbrook; Mickey Boardman, Editorial Director, PAPER Magazine; Nanette Lepore, Designer; Pat Cleveland, Model; Patricia Figueroa, Executive Director, Cámara de la Industria Textil, Confección y Zonas Francas de El Salvador (CAMTEX); Peter Hubbell, Founder/CEO, BoomAgers; Randy Harward, Vice President Materials, Under Armour, Inc.; Rio Uribe, Designer, Gypsy Sport; Robin Givhan, Fashion Critic, The Washington Post; Roxanne Lowit, Fashion Photographer; Sarah L. Scaturro, Head Conservator, The Costume Institute, The Metropolitan Museum of Art; Susan Chandler, Chief Merchandising Officer, Scott Kay; Susan S. Szenasy, Publisher/Editor-in-Chief, Metropolis Magazine; Susan J. Ganz, CEO, Lion Brothers Company; Teresa Frye, Owner/President, TechForm Advanced Casting Technology; Teri Agins, Fashion Journalist; Timo Rissanen, Assistant Professor, Design and Sustainability, Parson School of Design; Walter T. Wilhelm, Chairman, WWA Advisors, LLC. About Initiatives in Arts and Culture (IAC) is an organization committed to educating diverse audiences in the fine, decorative, and visual arts, as well as architecture. IAC's primary activities are conferences, publications, and exhibitions. These take an interdisciplinary approach, considering issues related to fabrication, connoisseurship, cultural patrimony, cultural preservation, and the future of culture. Particular areas of emphasis include American painting, the history and art of frames, the Arts and Crafts movement (internationally and in the U.S.), the art of metalworking in America, the influence of Asian cultures on American fine and decorative art, and the history and future of fashion and materials. IAC’s projects have been supported by a wide array of individual, corporate and foundation funders. 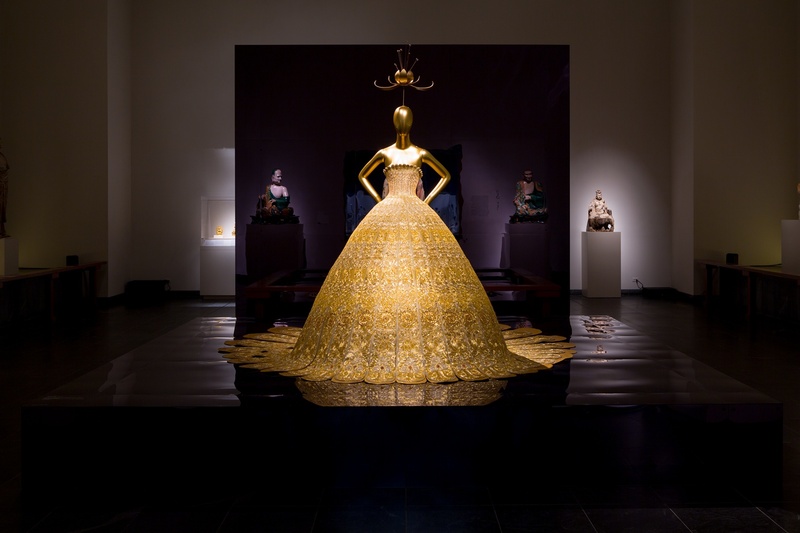 Photo Credit: Guo Pei, Evening Gown, spring/summer 2007 haute couture. Gold lamé embroidered with gold and silver silk, metal, and sequins. Courtesy, Guo Pei. Image © The Metropolitan Museum of Art.